Monday at the Museum saw us greeting some truly remarkable men. Working with the RAF Benevolent Fund, we welcomed four members of the Guinea Pig Club to celebrate one members 91st birthday and also the 75th anniversary of the founding of the club. The Guinea Pig Club was the name given, in typical dark military humour, to a social club comprising RAF aircrew who had survived fiery crashes when flying. Under the treatment of pioneering plastic surgeon Sir Archibald McIndoe, their long recovery paved the way for many of the modern plastic surgery techniques still in use today. His techniques that developed both successful surgery and also the mental rehabilitation of these men who had suffered disfiguring and painful injuries was ground breaking for it’s time. It was testimony to the great surgeon’s work that we were able to host these men who were in fine form to commemorate the founding of the club and the 91st birthday of Flight Engineer Jack Perry. The Guinea Pigs were much in demand for photographs and interviews with press and television and despite their advanced years were enjoying the whole occasion. With live Facebook from the RAF BF, BBC Radio York and ITV all present, they were kept quite busy until time for a VIP lunch. Jack Perry was just 19 years old when his Halifax Bomber crashed shortly after take off from RAF Topcliffe in North Yorkshire on 31 August 1944. You can read a full account of that fateful day on the RAF Benevolent Fund website. Jack suffered severe burns to his hands, face, and ears, undergoing 31 operations over four and a half years and earning him membership in the Guinea Pig Club. The Club, which celebrated its 75th anniversary on 20 July, was formed by a group of burned Allied airmen, the surgical ‘guinea pigs’ of pioneering plastic surgeon Sir Archibald McIndoe. 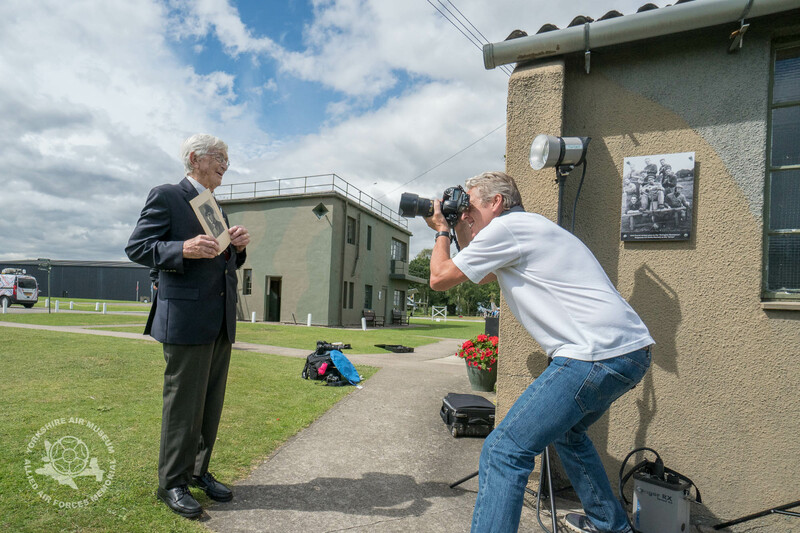 Yet for Jack, returning to Yorkshire was cause for celebration as he was joined at the Yorkshire Air Museum by fellow Guinea Pigs Mac Mathieson (age 94) of York, Sandy Saunders (age 93), and John Miles (age 88). The Guinea Pigs celebrated Jack’s birthday and the recent 75th anniversary of the Club. After Jack’s years of treatment in hospital, he married his wife, Mary, age 89, and had a successful career as a draughtsman. He credits much of his success in life to the treatment of Sir Archibald and the support of the Guinea Pig Club. Mac Mathieson of York suffered severe facial injuries and was blinded when the Perspex windscreen of his Lancaster bomber exploded in 1945. Operated on 10 times by Sir Archibald over the course of almost two years, Mac became a livestock adviser despite having lost his left eye and having very limited sight in his right eye. Today he has only 10% vision in his right eye. In 1945, Sandy Saunders was attempting to land a Tiger Moth trainer in strong crosswinds. The aircraft crashed and caught fire, killing the second crew member instantly. Sandy was knocked unconscious but came to and crawled from the burning wreckage. He suffered 40% burns to his face legs and hands. After a series of failed skin grafts, he was transferred to Archibald McIndoe’s care where he was able to recover. He joined us with his wife Maggie and the couple enjoyed climbing aboard our Halifax Friday the 13th for a tour of the interior, Sandy climbing all the way to the nose and lying down in the bomb aimer position. “It must have been both exciting and terrifying to be lying here,” he commented. It was a great privilege for engineer Phil Kemp to guide them around the aircraft before they enjoyed some lunch in the NAAFI. The RAF Benevolent Fund took over the running of the Guinea Pig Club around fifteen years ago and continue to support the club and as armed forces personnel from more modern conflicts suffer similar life changing injuries, the Club continues to find new members as they find ways to rehabilitate themselves into society. Meeting these men who have moved on from those injuries to enjoy full and active lives was inspirational. Medical science and patients recovering from burns injuries today have much to thank them for. The name Guinea Pig Club may sound chilling to some, but it is a badge they wear with great pride.